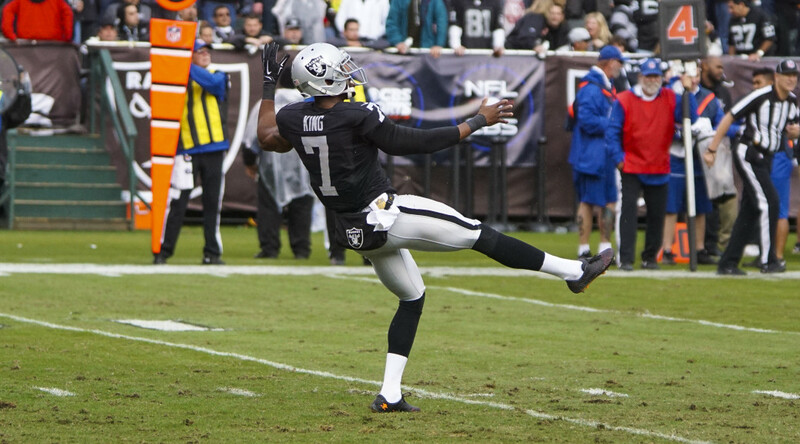 ALAMEDA, Calif. – The Oakland Raiders have signed P Marquette King to a long-term contract extension, the club announced Monday. Oakland originally signed the 6-foot, 195-pounder as an undrafted free agent in May 2012. After spending the 2012 season on the Reserve/Injured List, King has played in all 48 games for the Raiders over the last three seasons and has totaled 276 punts for 12,734 yards (46.1 gross average; 40.2 net average) with 94 punts downed inside the opponents’ 20-yard line. Last season, King punted 83 times for 3,697 yards (44.5 gross average; 40.7 net average) and set a franchise record with 40 punts placed inside the opponents’ 20-yard line. His 40 punts downed inside the 20 ranked second in the NFL in 2015. In 2014, King set single-season franchise records for punts (109) and punting yards (4,930). He also became the only punter since 1976 with at least 100 punts, at least 30 placed inside the 20-yard line and three-or-fewer touchbacks in a season. In his first full season in 2013, he led the NFL in gross punting with a 48.9 average. King played four years at Fort Valley State, where he earned first-team Southern Intercollegiate Athletic Conference honors and was named the team’s Most Valuable Player as a senior. A native of Macon, Ga., King attended Rutland High School in his hometown.